The purpose of the fuse within a BS1363 plug is to protect the cable. The correct size of the fuse is ultimately dependant on the current rating of the cable. However in most cases we can assume that the manufacturer has fitted the correct size cable and corresponding fuse, in which case the fuse rating recommended by the manufacturer should be used. If the appliance has a moulded (non-rewirable) plug fitted, the easiest way is to check the markings on the plug. 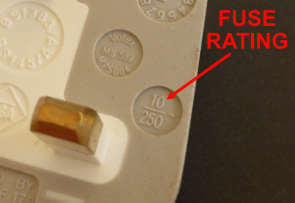 All UK moulded plugs (BS1363) must have the fuse rating marked on them. For an appliance rated as 700W or less, a 3A fuse should be fitted. For appliances above 700W, a 13A fuse should be fitted. One complication of using the 700W rule is that some appliances can draw a higher current when they are first switched on (inrush current). Electric motors for example can draw several times their normal load. So for some appliances, the simple 700W rule may not work and they must be fitted with a larger fuse than the power rating would suggest. A typical example is a vacuum cleaner that may be rated at less than 700W, but will require a 13A fuse to prevent the fuse from blowing when first switched on. BS1363 has standardised on just two preferred fuse ratings, 3A and 13A, however any fuse rating up to 13A can still be used. The non-standard fuses are coloured black and are available in 1A, 2A, 5A, 7A & 10A sizes. 5A and 10A fuses are often found in detachable leads connected to IT equipment and do not need to be changed provided they are appropriate for the size of cable. The cable and fuse size fitted by the manufacturer can sometimes seem to contradict standard cable current ratings. A typical example of this is a modern kettle. The kettle in our office is rated at 2.2kW, fitted with a 0.75mm2 cable, and protected by a 13A fuse. This initially seems incorrect as a 0.75mm2 cable is normally rated at just 6A and our kettle is drawing nearly 10A. However, if the manufacturer has fitted a cable that is less than 2m in length, BS1363 can allow a higher current rating and fuse size. Table 1. Figures taken from BS1363 for manufacturer fitted cables 2m and less. Note a - The figure in brackets indicates the fuse rating when a non rewirable plug is used with certain types of equipment where the use of a 5A fuse link is necessary because of the high instantaneous inrush current. Note c - The figure in brackets indicates the flexible cord size which may be used for cord sets where non-rewirable plugs are used with a maximum flexible cord length of 2m. This is also briefly mentioned in the IET Code of Practice. "Where manufacturer’s flex is less than 2m in length, has a csa of 0.75mm2 and is fitted with a non-rewirable plug, it may be rated at 10A and be fused to 13A, in accordance with BS1363 Table 2 note C." - IET Code of Practice, Page 133. If the cable originally fitted by the manufacturer has been lengthened, replaced, or if there is any doubt regarding the correct fuse size, the fuse rating should be based on the cable size. Where the power rating of an appliance allows, a smaller fuse than indicated may be used.